When Officer Christy Lynne Hamilton graduated from the LAPD Police Academy in February 1994, she received the Tina Kerbrat Award -- an honor voted on by her classmates and presented to the police recruit deemed "most inspirational." 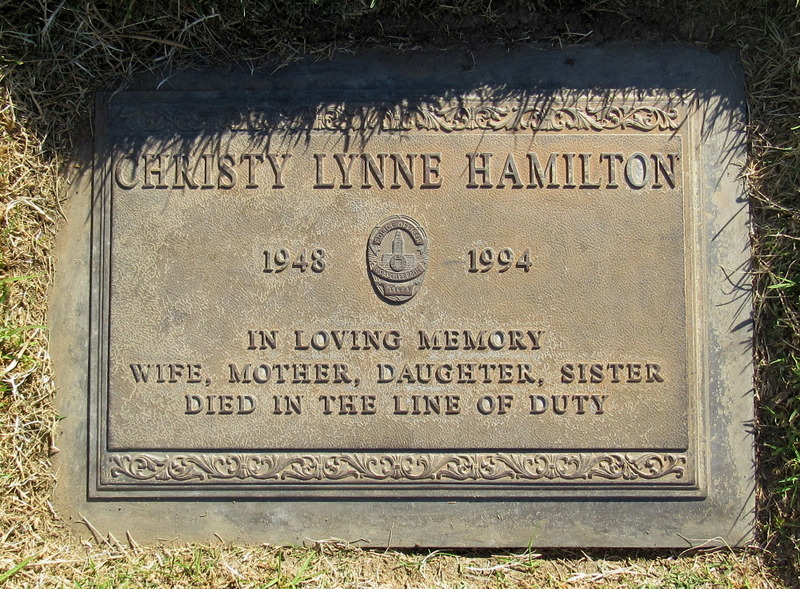 The award's namesake was shot to death in 1991, and was the first female LAPD officer to be killed in the line of duty. Four days after receiving the award, Hamilton became the second. Hamilton was born July 25, 1948, in Van Nuys, the youngest of three children of LAPD Det. Kenneth L. Brondell and Margie M. Windle Brondell. She attended Grant High School and Los Angeles Valley College, married George Steven in 1968, and had two children -- Kelley and William. She worked as the manager of her husband's family's nursery business in North Hollywood for 20 years. After her first marriage ended in divorce, she married Steve Hamilton, a Los Angeles firefighter with two children from a previous marriage. She went back to school and earned a degree from Cal State Fullerton in 1992. She also left the nursery business and decided that it was time to realize her lifelong dream -- to follow in her father's footsteps and become a police officer. Hamilton was 44 years old when she started eight months of training at the Police Academy, after the LAPD lifted its age limit of 34. Not only was she the oldest recruit, but most of her classmates were closer in age to Hamilton's two children. Hamilton knew that her toughest challenges at the Academy would be the physical tests, including navigating an obstacle course, and climbing over a six-foot-high wall. Hamilton would often go out early to work on her obstacle course run, and she built a six-foot wall at her home to practice her climbing. Her class graduation ceremonies were to have been held in late January 1994, but were delayed because of the Northridge earthquake on Jan. 17. The new officers in Hamilton's class had been on the streets for about a month when the ceremonies were finally held on Friday, Feb. 18, 1994. After her graduation, Hamilton, the oldest woman ever to graduate from the Police Academy, stood with her proud father, who retired from the LAPD in 1975. "I just followed it through, and here I am," she told reporters. "My father was a Los Angeles police officer for 30 years. I always wanted to be a police officer, but I got married when I was 19, started a family, and my life sort of changed." Hamilton's dream had finally come true. She was a 45-year-old LAPD rookie officer. Four days after the ceremony, at about 1 a.m. on Tuesday, Feb. 22, 1994, an LAPD 911 operator received a call from a 17-year-old who said that he had just killed his father. The teen gave an address on Amestoy Avenue in Northridge. Neighbors also called to report hearing gunshots coming from the house. What the responding officers didn't know was that the teen was hiding in the yard, waiting to ambush them when they arrived. He was crouched behind a brick wall on the side of the house at the corner of Amestoy Avenue and Septo Street, on an embankment about 10 feet above street level, armed with an AR-15 semi-automatic rifle -- the civilian version of the military’s M-16. Six officers in three police cars from the Devonshire Station arrived at the scene within minutes. As the officers got out of their cars, the teen opened fire, shattering windows in two of the police cars, and leaving nearly a dozen bullet holes in the cars' side panels. As the gunfire started, Hamilton, who was wearing a protective vest, crouched down behind the open driver's door of her police car and reached for the police radio. One shot went through the car door, hit Hamilton in the arm opening of her vest, and went into her chest. After firing about 15 rounds, the teen stopped shooting and went into the house. Additional police cars arrived along with an ambulance, which took Hamilton to Northridge Hospital Medical Center, about four miles away. She was pronounced dead about an hour later, with her father and Police Chief Willie Williams at her bedside. While fellow officers and medical personnel were removing Hamilton from the scene, five or six shots were heard from inside the house. Shortly before 6 a.m., after attempting to contact the teen for several hours without success, SWAT officers tossed tear-gas canisters into the house. A few minutes later, they entered the house and found the bodies of the teen and his father. Both had been shot to death, with the teen committing suicide. The teen had apparently killed his father, a Vietnam veteran and gun collector, in a dispute over loud music. In addition to the fatal bullet hitting Hamilton in an unprotected area of her body, several other factors combined to contribute to the tragedy. The shot that killed Hamilton first passed through the driver's door of the police car. At the time, LAPD vehicles weren't equipped with bullet-resistant door panels. Today, every patrol car has protective, armored panels. In the case of an active shooting situation, police officers typically don't park directly in front of the scene. They are taught to park a short distance away and assess the situation before acting or calling for additional help. According to LAPD policy, SWAT teams would only be called if the responding officers had verified that there was a gunman inside the house. In this case, an unidentified woman who was in the house when the teen killed his father ran outside with her cell phone, and made one of the 911 calls. When police officers arrived, it was too dark to see the house numbers, but they saw the woman half-way down the block on Amestoy Avenue, waving her arms and walking toward them. The officers assumed that the woman was standing near the house, so they parked at the corner of Amestoy and Septo -- directly in front of the hidden gunman. A police helicopter with a spotlight could have flown over the scene and spotted the gunman hiding behind the wall, but the helicopters were grounded that night because of high winds. More than 3,500 police officers, from as far away as Oklahoma City, attended Hamilton's funeral services at Grace Community Church in Sun Valley, and graveside services at Forest Lawn Memorial-Park in Hollywood Hills. In addition to family, friends and fellow officers, the mourners included Police Chief Williams and California Gov. Pete Wilson. Hamilton's 24-year-old daughter, Kelley Steven, spoke at her mother's funeral service, and recalled the time her mother told her that she wanted to be a police officer. "She asked me if she was crazy," Steven said. "I thought she didn't have a chance. But if you tell my mom she's incapable of anything, she will prove you wrong." The family history of public service didn't end with Hamilton. Her older brother, Kenneth Brondell Jr., was a fire inspector for the Los Angeles City Fire Department for more than 30 years before he retired. Her niece, Susan Brondell, served as an officer with the San Diego Police Department. Hamilton's sign is located on the northeast corner of Lassen Street and Amastoy Avenue.